Distracted driving is a problem affecting all ages of drivers across the United States. Many drivers simply do not recognize the extent of the problem…until a distracted driving accident happens to them. While the population of the United States is edging close to 320 million, there are as many as 2.5 million Americans who are involved in a car accident each year. Although this number includes minor parking lot bump-ins as well as serious and fatal auto accidents, it still reflects the fact that most drivers in the U.S. will be involved in an auto accident approximately every 17 years. About 37,000 people will die from those accidents, and as many as 1.6 million of the accidents involve a cell phone. As many as 330,000 car accidents a year which lead to severe injuries, are the result of a driver texting while driving. Some studies show that a full three-fourths of all distracted drivers are distracted by a cell phone. One in four car accidents in America are the result of texting while driving. Perhaps even more shocking is the fact that texting and driving is six times more likely to result in an accident than drunk driving. Those who text and drive will increase the time they spend with their eyes off the road by as much as 400 percent. Teens are the worst offenders regarding texting and driving—11 teens die each day in the U.S. as a result of texting and driving. A quarter of all teens admit they respond to at least one text every single time they get behind the wheel. Reaction times for a teenager using a cell phone are roughly equal to the reaction times of a 70-year-old who is not using a cell phone. Of course, cell phones are far from the only culprit associated with distracted driving. 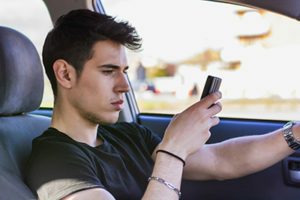 Other types of distractions include eating while driving, reaching for objects while driving, interacting with others in the car, changing radio stations, turning around to see what the children are doing in the back seat, watching something happening on the side of the road, and even crying. Any of these distractions can more than double your risk of a car crash. Some drivers even read or write while driving, while others drive while they are fatigued, angry, sad, or highly emotional. There are essentially three types of distraction—visual, manual and cognitive. When you are visually distracted, you take your eyes away from the road. A manual distraction forces you to take your hands off the steering wheel, and a cognitive distraction takes your mind away from your driving and the safety of other drivers. Turning up the heat in your car is usually a manual distraction—that is, if you are familiar with the car and don’t have to look to find the heater controls. Texting while driving is so dangerous because it combines visual, manual and cognitive distractions, taking your eyes off the road for as long as five seconds—the time it takes to travel the length of a football field driving 55 mph. If you or a loved one has been injured by a distracted driver, it could be important for your future to speak to an attorney immediately. Your attorney will have your best interests at heart, and will work hard to ensure you receive an equitable settlement. Contact the experienced Colorado Springs car accident attorneys at the Green Law Firm today to schedule a no-obligation consultation and discuss your case. Call us today at 1-719-694-8515.